A novel herpesvirus called EEHV1 was identified originally as the cause of fatal acute haemorrhagic disease in young Asian elephants and another species EEHV2 was found in African elephants (Richman et al 1999). However, since 2007 many more elephant herpesvirus types have been detected with a total number of 12 species and four sub-species now known. The eight different EEHV species are all classified as members of the Proboscivirus genus, which evidently initially evolved separately from all other mammalian herpesvirus groups when its hosts the ancestors of modern elephants diverged from all other placental mammals over 100 million years ago. They then branched further into multiple EEHV species between 10 to 40 million years ago, long before Asian and African elephants and the woolly mammoths diverged from a common ancestor about 7 million years ago. Six of the eight different species or sub-species of Proboscivirus identified in elephants, namely EEHV1A, EEHV1B, EEHV2, EEHV3, EEHV4 and EEHV5, have all caused cases of fatal hemorrhagic disease (Garner et al, 2009; Latimer et al, 2011). However, by far the major culprits have been an assortment of different strains of the two partially related chimeric versions of EEHV1 (referred to as EEHV1A and EEHV1B). As in most mammals, several distinct species (five) of yet another very highly diverged type of herpesvirus called gamma herpesviruses or EGHVs have often been found in oral and eye secretions, as well as in oral mucosal papillomas, from both Asian and African elephants in the USA, but these do not seem to cause any lethal disease. Inapparent lifetime long latent infections by herpesviruses are very common in nature, where they have adapted well to their natural hosts and only rarely cross host species barriers or cause severe disease. In fact, most human adults unknowingly harbor latent infections by between four and seven of the eight different species of human herpesviruses, which sometime result in chicken pox (primary VZV), roseolla (HHV6B), mononucleosis (EBV), cold sores (HSV1), genital herpes (HSV2) and shingles (reactivated VZV) in healthy people. They are most commonly transmitted in saliva, with only one (HSV2) being sexually transmitted, but some (EBV, KSHV) trigger certain kinds of rare cancers, and (together with HCMV) can have serious consequences in immunosuppressed AIDS and organ transplant patients. It is now also very clear that this is not just a disease of zoos or of captivity. There are pathologically consistent reports of at least 24 lethal haemorrhagic disease cases recently attributed to EEHV also in orphans and wild calves within several Asian range countries. A laboratory for collecting and diagnostic testing of suspected samples has been set up by the Kerala Wildlife Service in association with National Elephant Herpesvirus Laboratory in Washington DC, and the Johns Hopkins University Herpesvirus research group. Much additional research is urgently required to further evaluate this situation within wild-range countries. Microscopically visible particles and intracellular inclusion bodies consistent with being herpesviruses were first described in the 1970s and 1980s in characteristic localized skin nodules on the trunk and head of several juvenile African elephants in Florida, as well as in pulmonary nodules within the lungs of otherwise healthy culled adult African elephants at Kruger National Park. The visible skin and genital growths or lesions usually regress after several weeks and are thought to represent occasional reactivation from hidden "latent" infections. Although these were originally thought to be the same species (EEHV1) that caused hemorrhagic disease in Asian elephant calves, several recent studies have instead now revealed that both skin and lung nodules from African elephants in South Africa, the USA and Kenya all contain one or more of the EEHV2, EEHV3, EEHV6 and EEHV7 species, but probably not EEHV1. Only two ex situ African elephant calves are known to have died of EEHV2-associated hemorrhagic disease (Kijana) and one survived mild viremic EEHV6 disease. Asian elephants: Acute hemorrhagic disease. Primary EEHV infection can sometimes cause fatal haemorrhagic disease in young Asian elephants. This disease has a sudden acute onset and preferentially targets calves or juveniles between the ages of one and eight years (with more than half of those between one and three years of age). Initial clinical signs (symptoms) include lethargy, facial and neck swelling (oedema) and purple tongue (cyanosis), which then progresses rapidly to an uncontrolled severe viremic condition involving damaged endothelial cells in blood vessels of the heart, liver and most major internal organs. The first case was identified in 1995 at the Washington Zoo and reported in Science in 1999 (the earliest confirmed case is from 1983). A total of at least 80 cases of suspected EEHV hemorrhagic disease have now been recorded worldwide, including in Europe, the UK, USA, Canada, Thailand and India. The acute form of the disease has had an 80 to 90% fatality rate (Latimer et al, 2011). Although most cases have involved young captive-born Asian elephants, only one was less than one year of age (suggesting a possible protective role of maternal antibodies), but several cases have involved older wild-born Asian adults (up to 40 years of age). DNA PCR tests can be carried out on the blood and serum within 12 to 24 hours. This �viremia or DNAemia� test has been used to confirm acute EEHV disease cases and to trigger successful drug treatment of symptomatic animals. Without treatment, afflicted elephants that have reached this stage of disease usually die very fast, in several cases within 24 hours. In all nine examples of �cures� EEHV1-infected calves with confirmed positive PCR DNA blood tests survived after quick early treatment with famciclovir (500 mg/70 kg body-weight, 3-4 weeks). These animals then became DNA-negative after several weeks of monitoring blood samples. Some surviving calves had a transient peak of up to 100,000 EEHV1 viral genomes/ml blood with mild symptoms, whereas those that died with or without treatment reached levels as high as 50 million viral genomes/ml blood (and had easily detectable virus in the serum as well). Two treated female calf survivors have since gone on to produce healthy calves of their own. The standard diagnostic PCR blood test has rarely been positive in healthy elephants (unless undergoing an asymptomatic primary or reactivated infection episode), but unfortunately even this expensive drug treatment has not been effective in many other cases. Of 78 Asian elephants born in the United States and Canada between 1978 and 2007 that lived up to two months of age, 19 died of this disease, and seven more might have if not treated successfully. Officially �saved� elephant calves include Doc, Chandra, Obert, Jade, Maliha and Barack. It is likely that as for most herpesviruses EEHV1 is endogenous and almost ubiquitous in all Asian elephant populations. Constant monitoring and use of more sensitive real-time PCR tests (Stanton et al, 2010) have provided increasing evidence that many healthy wild-born Asian elephants in captivity periodically shed low levels of �reactivated� EEHV1 virus in trunk wash secretions (Stanton et al, 2010), implying that they not only carry �latent� infections, but presumably survived mild infections when young. Serology tests for evidence of antibodies that indicate prior EEHV infections have been positive in between 15 and 30% of all Asian and African elephants tested in North America. Amongst the 37 suspected cases of EEHV-associated hemorrhagic disease in Asian elephants in North America, 30 have been confirmed by DNA analysis of blood or necropsy samples. This number includes the seven calves that survived after treatment with anti-herpesvirus drugs (either aciclovir or ganciclovir) that were designed for use in humans and administered very quickly after diagnosis. Amongst those 30 cases, 24 were caused by EEHV1A, four by EEHV1B, and one each by EEHV3 and EEHV4. However, a considerable number of sub-clinical viremias in Asian elephants associated with either EEHV1A, EEHV1B or EEHV5 have also now been detected. In Europe, there have been 24 suspected cases, including six in 2009 to 2011, and with only two known drug-treated survivors. Amongst the European deaths that have been most extensively evaluated by DNA subtype testing, seven were EEHV1A cases, two were EEHV1B cases and one an EEHV5 case. In Asia, more than 24 suspected cases have been reported with four DNA confirmed cases in Thailand (3x EEHV1A, 1x EEHV4), one in Cambodia (EEHV1A) and nine in Southern India (8x EEHV1A, 1x EEHV1B). Alarmingly, there have many more anecdotal cases as well from Myanmar, Nepal, Thailand and Sumatra. The nine cases collected and studied by Arun Zachariah in India between 2007 and 2011 that had high quality pathogenic necropsy tissue DNA available for analysis included six orphans being reared in working or training camps or at a zoo, and four sudden deaths in calves found serendipitously in free-ranging wild herds by alert mahouts or veterinarian wildlife officers. Almost all cases of EEHV1A and EEHV1B disease have involved genetically distinguishable �strains�, even when involving multiple progeny of the same breeding cow or bull, and with no two facilities ever having been found to have the same strains. This includes eight distinct strains being found amongst the nine cases in Southern India, indicating that this is probably not a new disease there and that these viruses have been around in Asia for a very long time (Zachariah et al, 2012, in press). Thus, this is clearly a sporadic not an epidemic disease, and there has been no direct chain of transmission from one facility to another. However, exactly the same strains of virus are often found being shed periodically in trunk secretions by multiple healthy herdmates, including the same strain that had killed a calf at that same facility several years previously. Three cases are known of pairs of calves that died within a few days or weeks of each other at the same facility. In each case these proved to involve identical strains of the virus and were therefore evidently directly epidemiologically connected. However, in contrast, at six elephant housing facilities in North America and Europe that had multiple cases of hemorrhagic disease, strains of both EEHV1A and of EEHV1B were involved at different times. Furthermore, five closely monitored surviving young Asian elephants at USA facilities have been found to undergo primary infections with first a strain of either EEHV1A or EEHV1B that was cleared and resolved within a few months, but this was then followed subsequently within a year by a second infection with a strain of the other EEHV1 subtype. In each episode, the infection showed up first as transiently elevated levels of virus DNA in blood samples followed a few weeks later by elevated shedding of viral DNA in trunk washes (Stanton et al, 2012). Therefore, although it appears normal for all Asian elephant calves to become latently infected and to periodically reactivate one or more species of EEHV, for reasons that are not yet understood, primary infections by either EEHV1A or EEHV1B apparently progress to lethal or severe disease in at least 20% of all Asian elephant calves born in captivity. Five examples of EEHV5 infections in Asian elephants have now also been observed, with one in Europe being lethal, whereas those in the USA had only very mild symptoms but did spread within all members (including calves) of a closely monitored herd within a few months of initial detection in blood and trunk washes (Atkins et al, 2012). EEHV4 has only been detected twice so far, but both times in cases of lethal hemorrhagic disease in Asian elephant calves, once in the USA and once in Thailand. Therefore, like EEHV1A and EEHV1B, both EEHV4 and EEHV5 are now all thought to be endogenous viruses of Asian elephants, but whether prior infections with the latter might provide protective immunity against EEHV1 is unknown, and whether the apparent rarity of disease associated with EEHV4 and EEHV5 is because they are far less abundant or are less pathogenic is not clear. In only a single known case has an obviously natural African elephant virus (EEHV3) been responsible for the death of an Asian elephant calf. 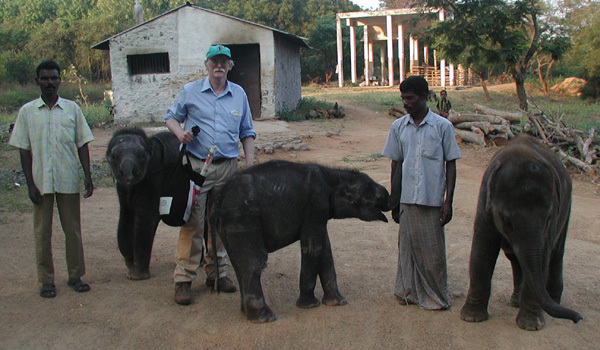 Dr Gary Hayward and elephants in Vandalur Zoo in Chennai, India. 1. Comparison of the Gene Coding Contents and Other Unusual Features of the GC-Rich and AT-Rich Branch Probosciviruses. Strong DNA positive with hemorrhagic tissue at necropsy and appropriate clinical symptoms = counted as a survivor. Individuals having low level viremias (DNA positive in blood) without clinical symptoms(asymptomatic) Also occasional periodic reactivated DNA-positive shedding in saliva/trunk wash (but not in blood) is also quite common and has no disease significance except as confirmation the individual elephant has latent infection (ie likely seropositive from a previous natural low level infection) = not counted as a survivor.